Oriental gooseberry is a fruit of colder regions. It grows in the arid regions of Himalayas, from Afghanistan to West Nepal at altitudes of 2300 to 3700 m. The fruits are edible but not very tasty. Still these are eaten by local people. Shrubs 0.5-2 m tall, usually dioecious, vegetative parts pubescent, sticky glandular and/or shortly stalked glandular; branchlets stout, unarmed; buds reddish brown, ovoid to oblong, 5-6 mm, apex obtuse or acute. Petiole 1-2(-3) cm; leaf blade suborbicular to reniform-orbicular, 1-3(-4) cm, base truncate to shallowly cordate; lobes 3-5, margin irregularly coarsely dentate or doubly dentate, apex obtuse or acute; terminal lobe subequaling lateral ones. Inflorescences and most flower parts pubescent and glandular pubescent; male racemes erect, 2-5 cm, 15-30-flowered, female ones 2-3 cm, 5-15-flowered, to 4 cm in fruit; bracts lanceolate to elliptic, 5-9 mm, 1-veined; flowers rarely bisexual; pedicel 2-3 mm; calyx purple to purplish brown; tube broadly saucer-shaped to rotate, 1-2 mm; lobes erect, ovate to subligulate, 2-2.5 mm, usually obscurely 3-veined; petals subflabellate to subspatulate, 0.5-1 mm, ± pubescent; stamens slightly longer than petals; ovary ovoid, style 2-lobed. Berries deep red, slightly pubescent and glandular, 6 mm in diameter. Fruits are edible and eaten by local people. These are, however, not very tasty rather bland. 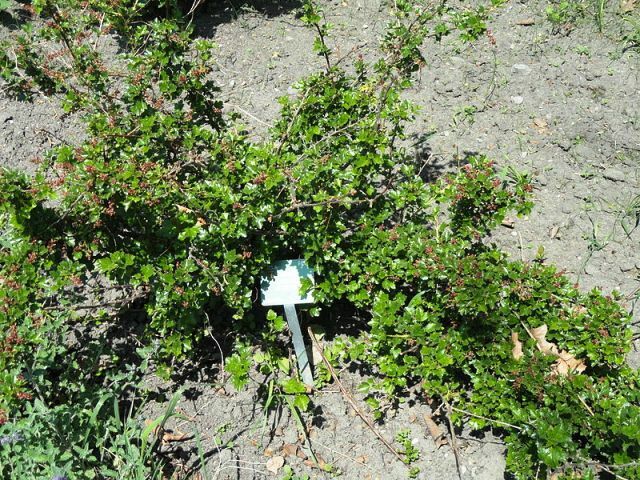 Oriental gooseberry shrubs grow best in well drained loamy soils. 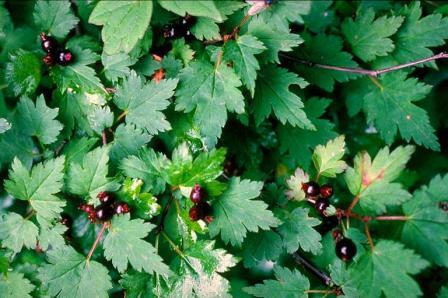 Plants are quite tolerant to shade though do not fruit well if adequate sunlight is not there. This fruit is very cold hardy and can withstand upto -20 C.
New plants can be raised from seed which requires three months’ stratification before sowing. Semi-hardwood cuttings can also be planted. The best time for planting cuttings is July.